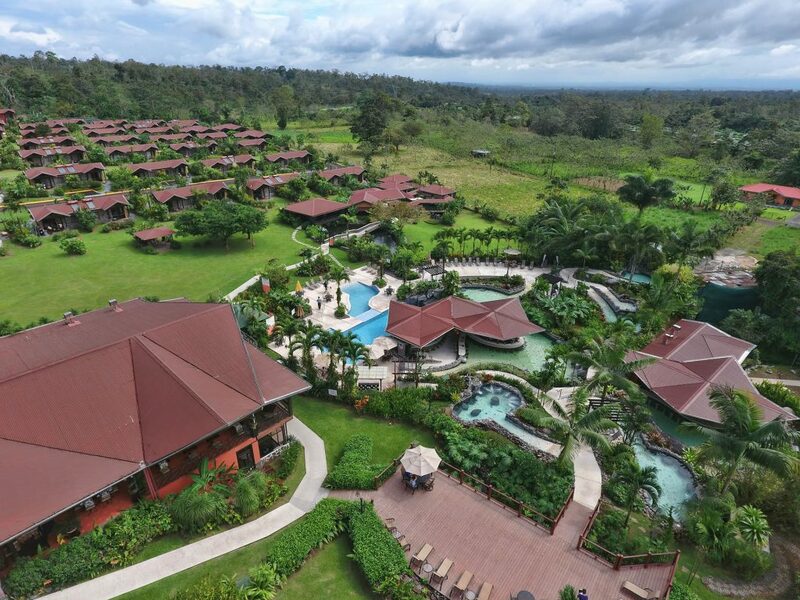 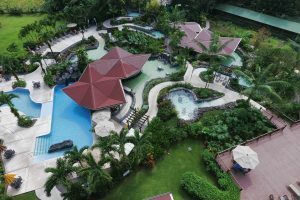 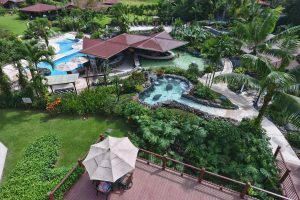 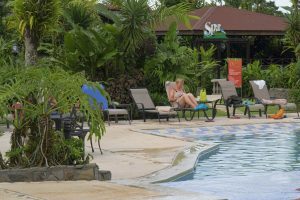 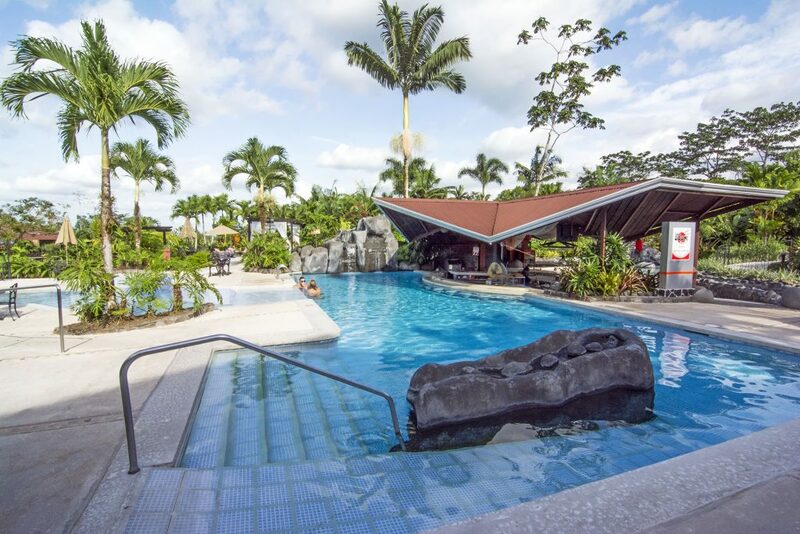 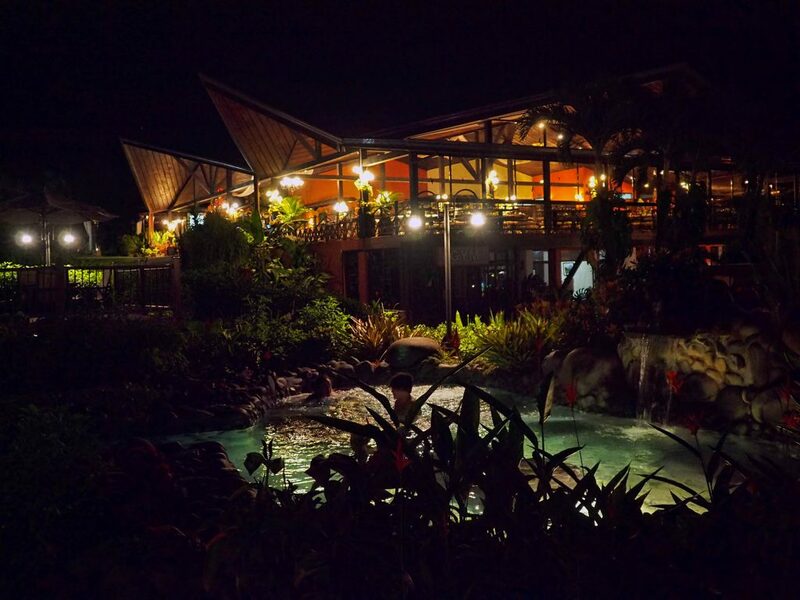 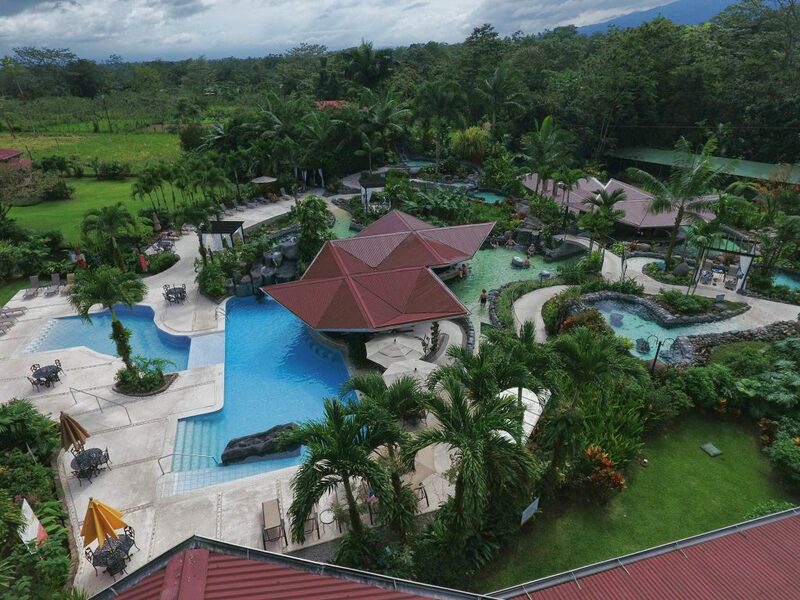 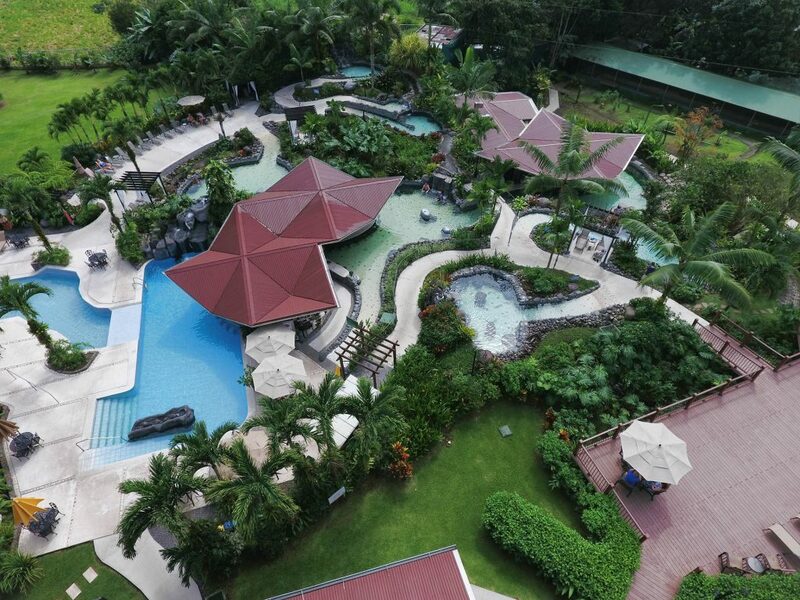 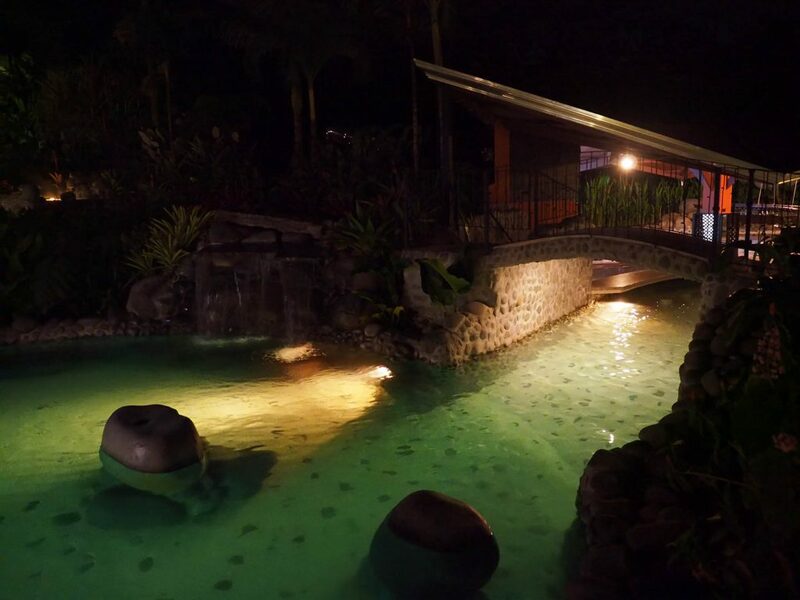 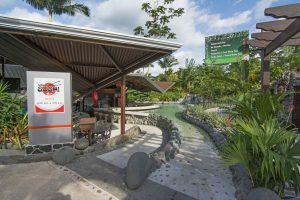 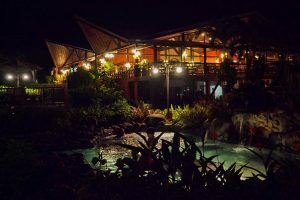 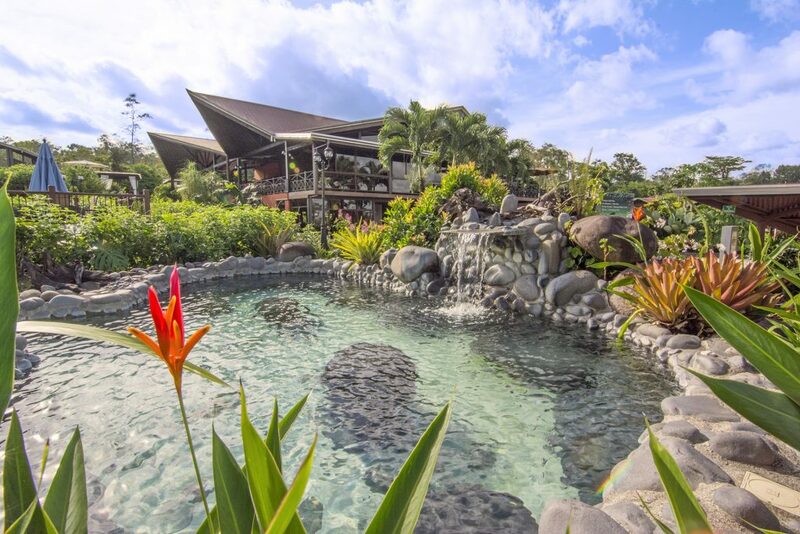 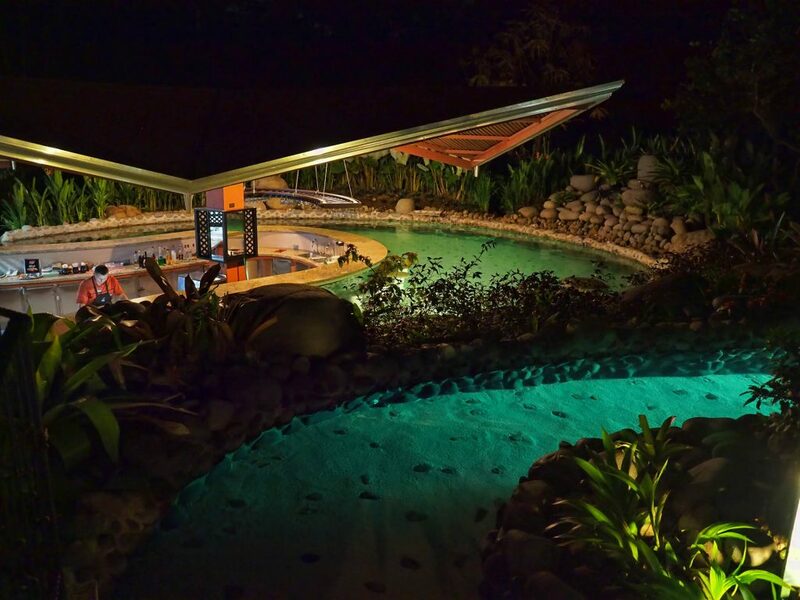 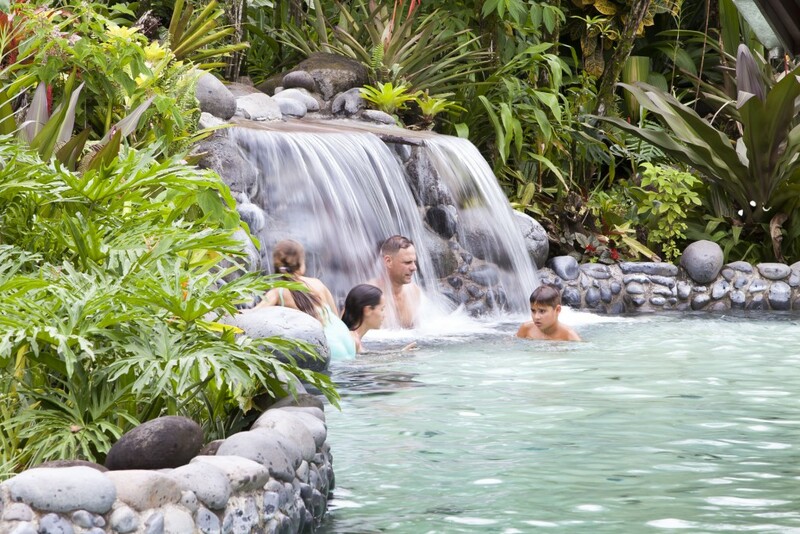 The hot springs of Arenal Springs Hotel are hundred percent natural and rich in mineral salts and ions such as Calcium (CA+2), Magnesium (Mg+2) and Chloride (CL-) as they come from underground sources of the Arenal Volcano. 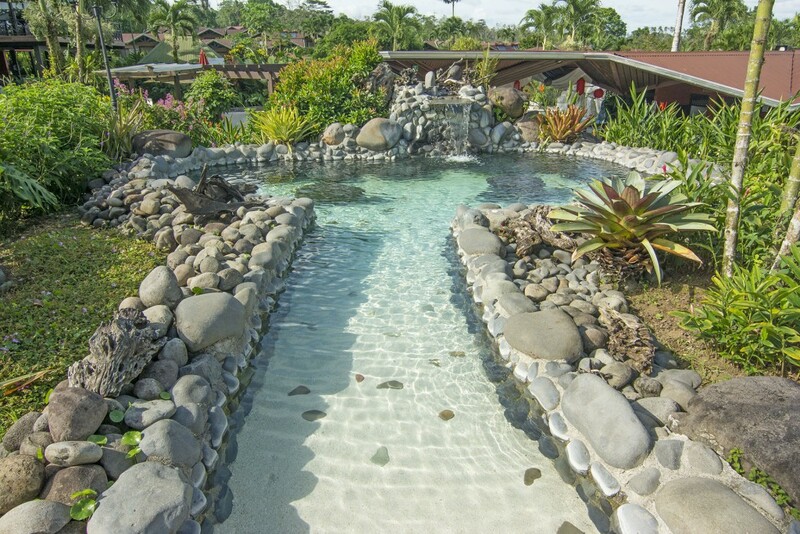 Due to high mineral concentration, while soaking in these waters, your skin is moisturized and refreshed. 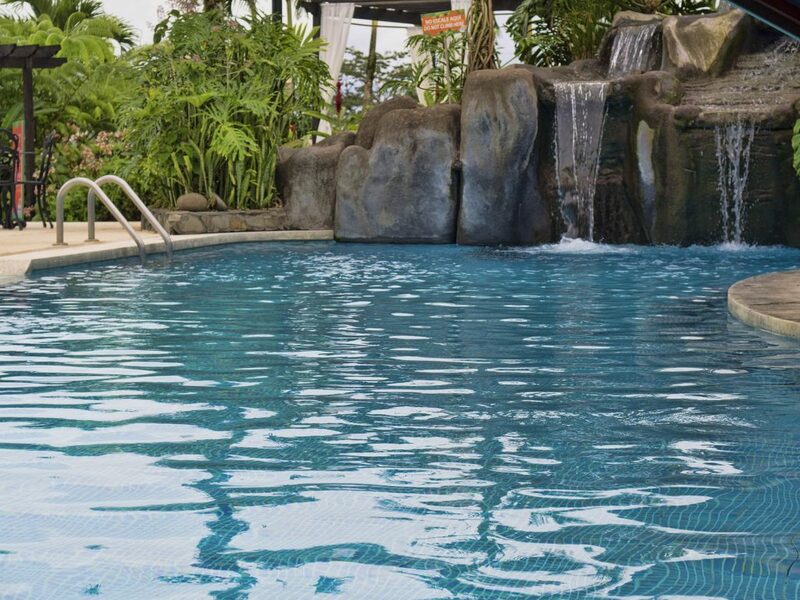 Four different temperatures pools ranging from 34 ° to 39 ° degrees, (93-104F) PH 6.7. 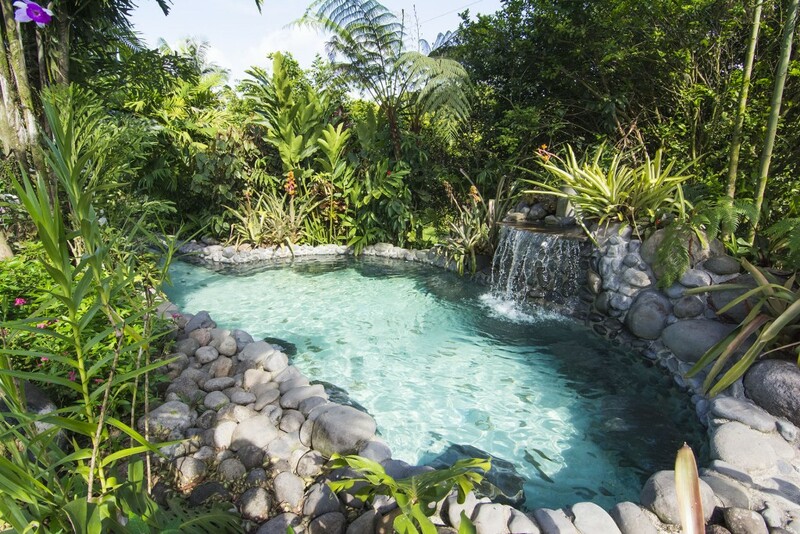 Our hot springs have been created to give you the feeling that you are in natural thermal river in the middle of the rainforest. 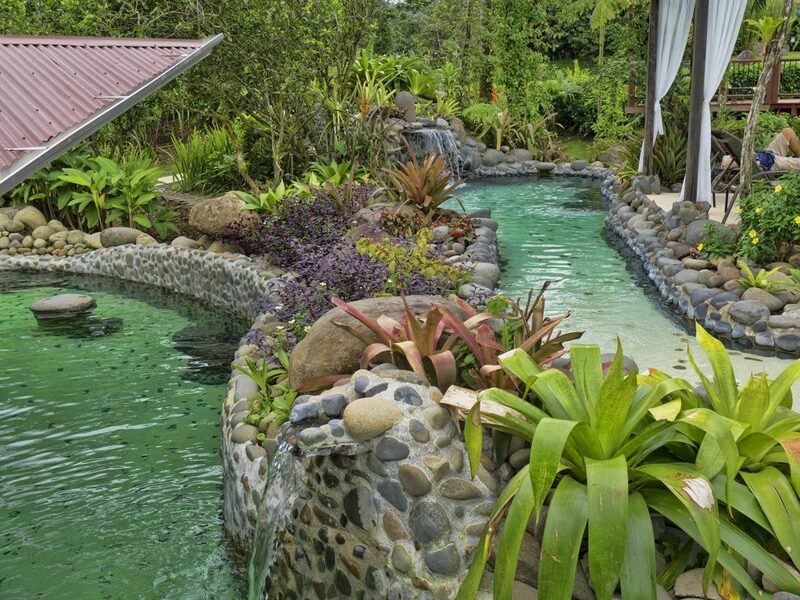 Tropical gardens surround the river to add to the sensation. 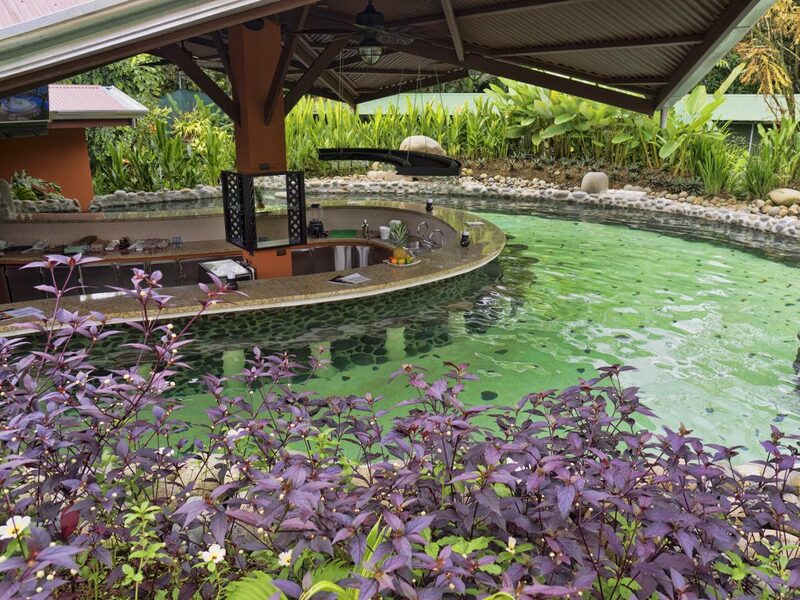 The floor of the pools is made from limestone which adds to the soothing atmosphere. 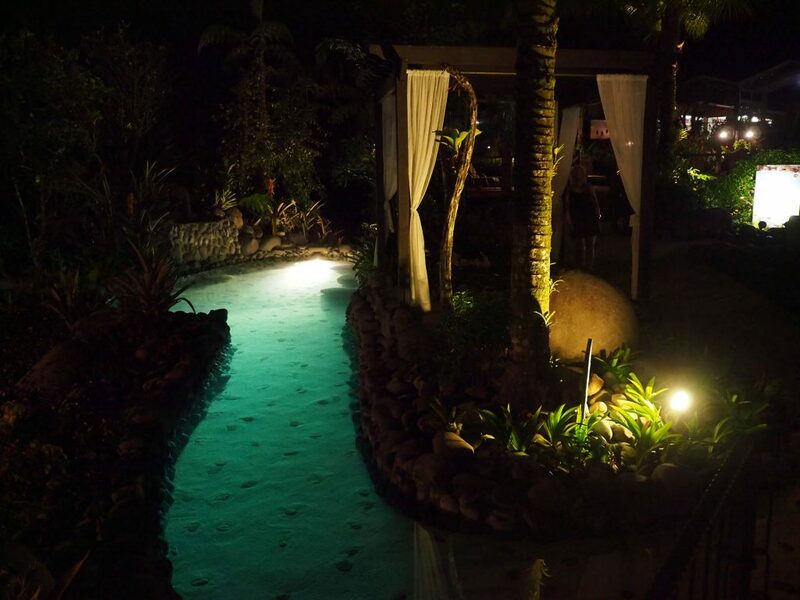 The light color allows you to see your feet and verify the cleanliness of the waters. 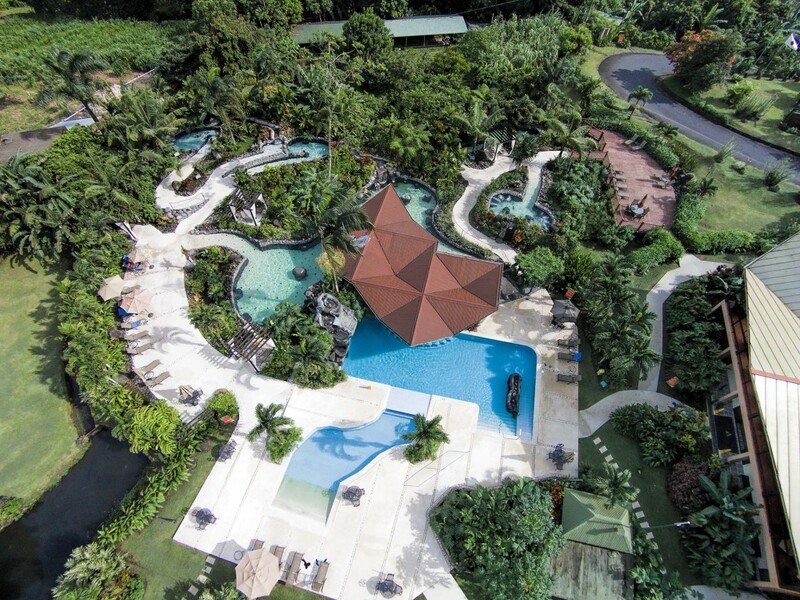 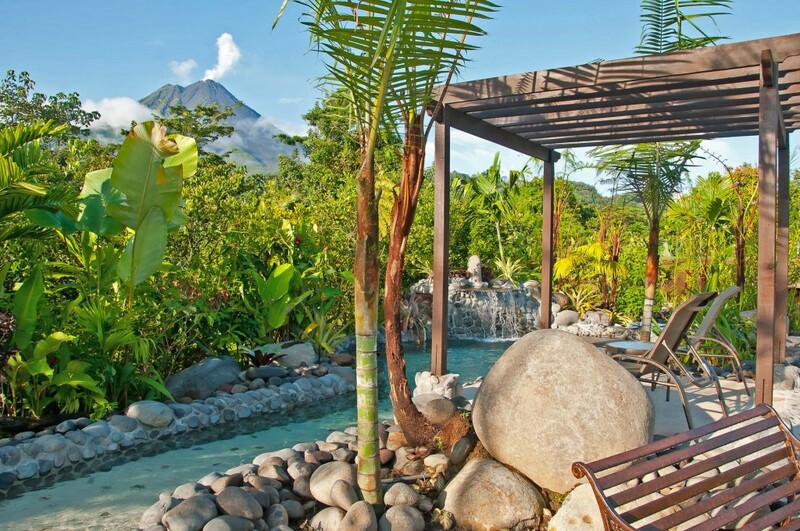 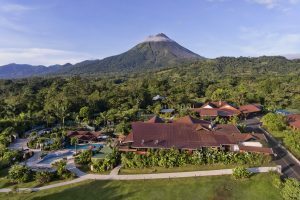 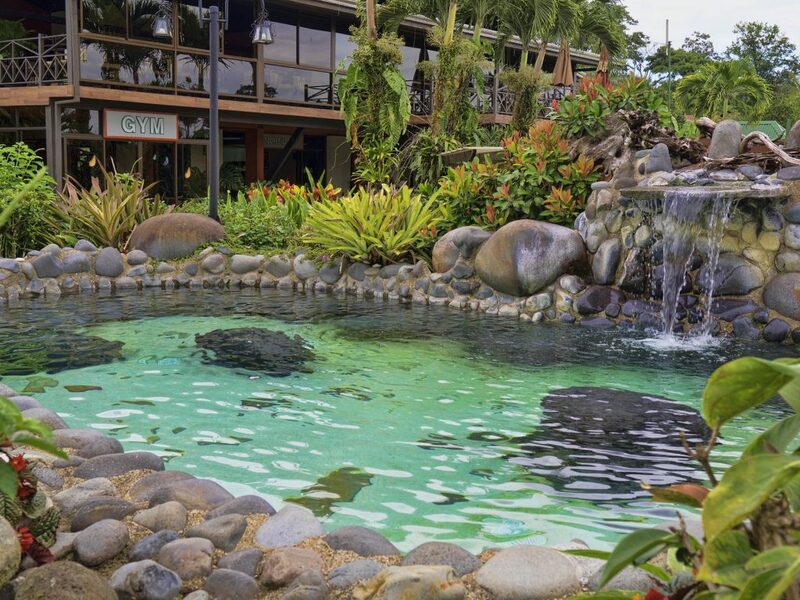 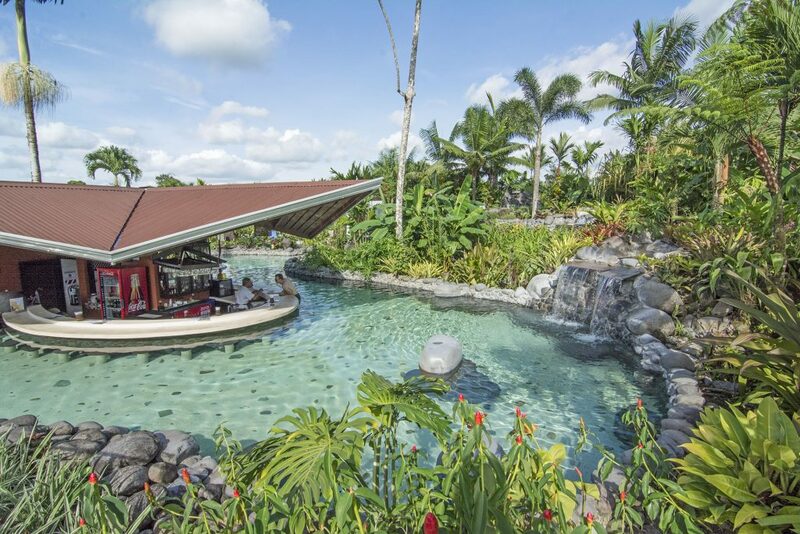 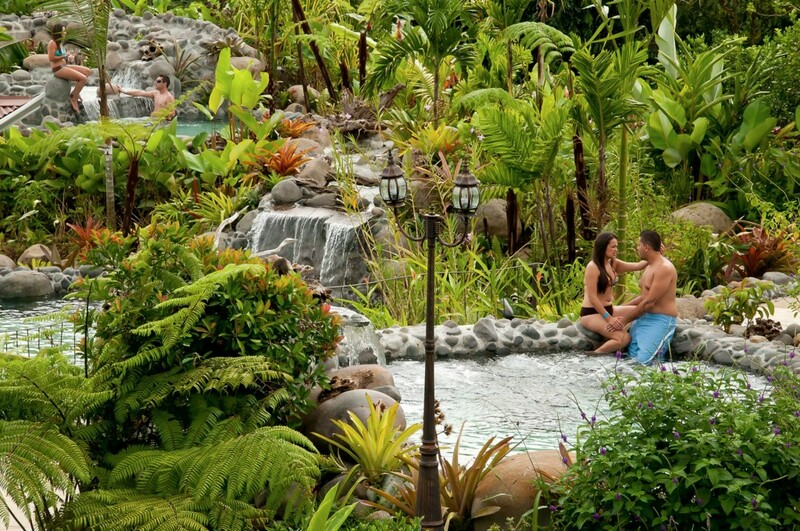 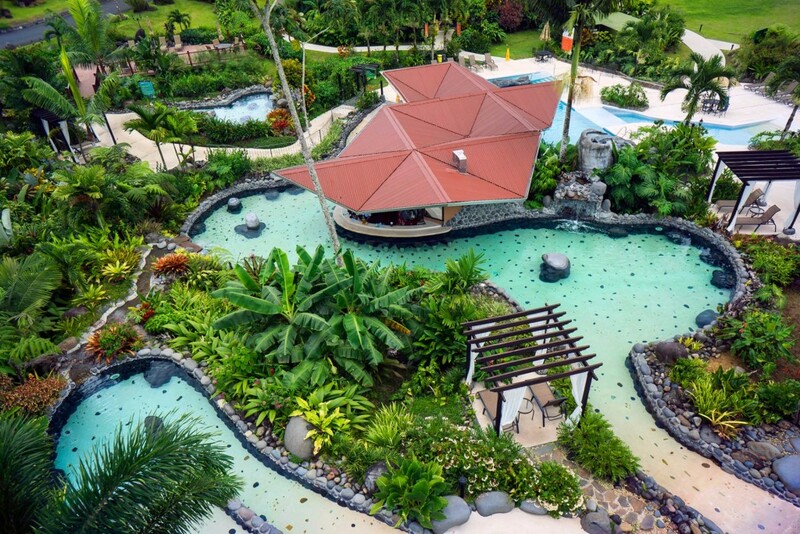 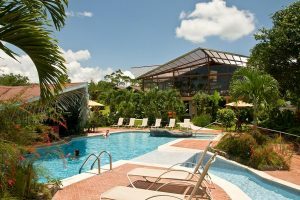 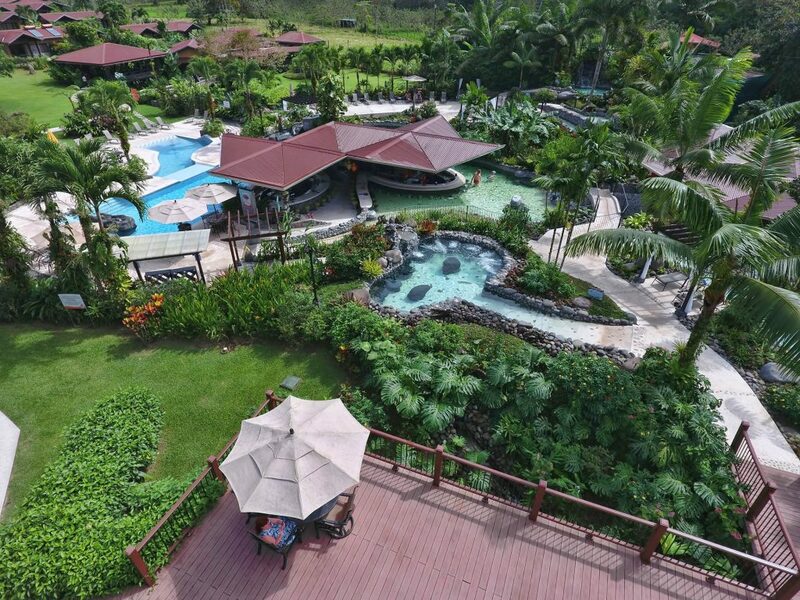 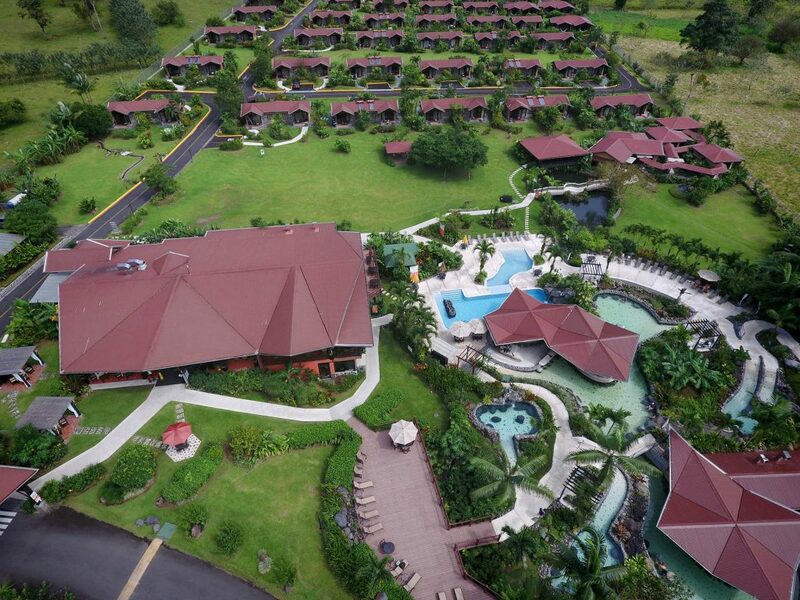 The thermal water is naturally heated by the Arenal Volcano and its underground rivers. 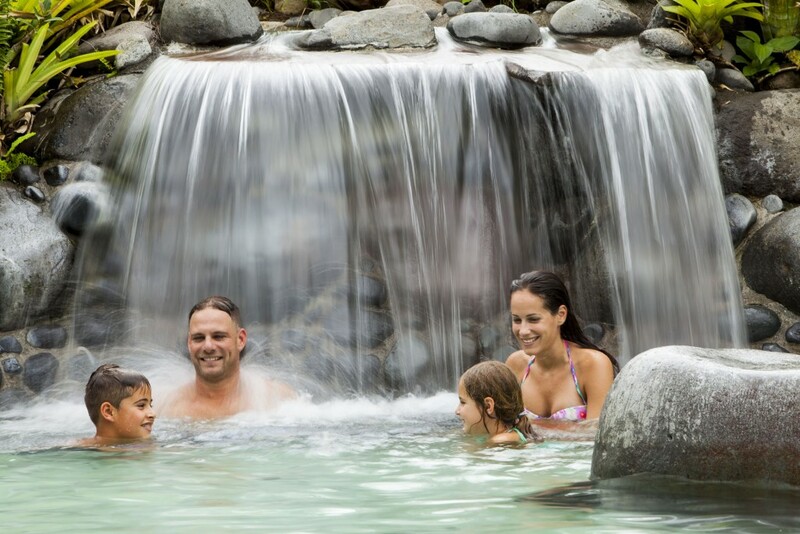 The water reaches our thermal pools taking advantage of the force of gravity without the need for pumping or drilling. 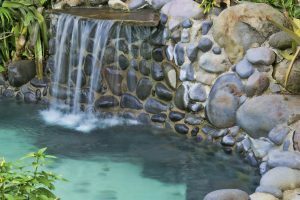 The minerals naturally found in the water, such as calcium, magnesium, sodium bicarbonate, and chloride contribute to a complete relaxation of mind and body, promote circulation, and help to balance pH levels, liberate free radicals, soften both skin and hair, and promote better sleep. 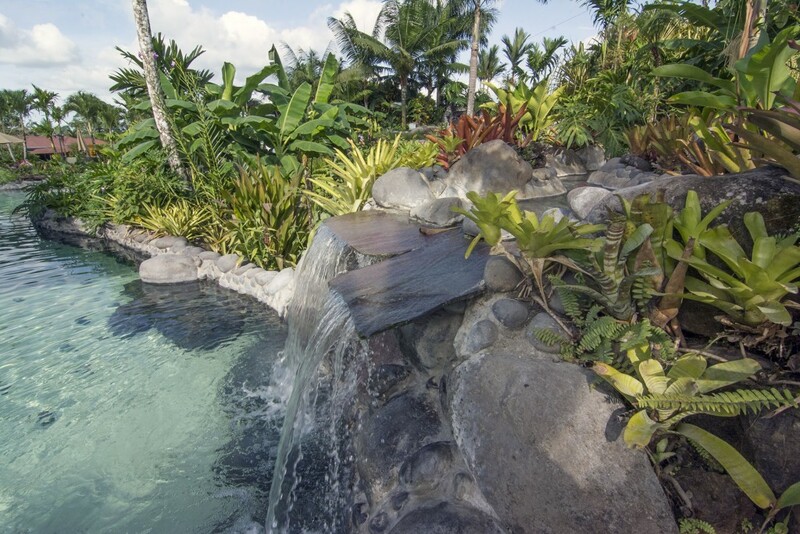 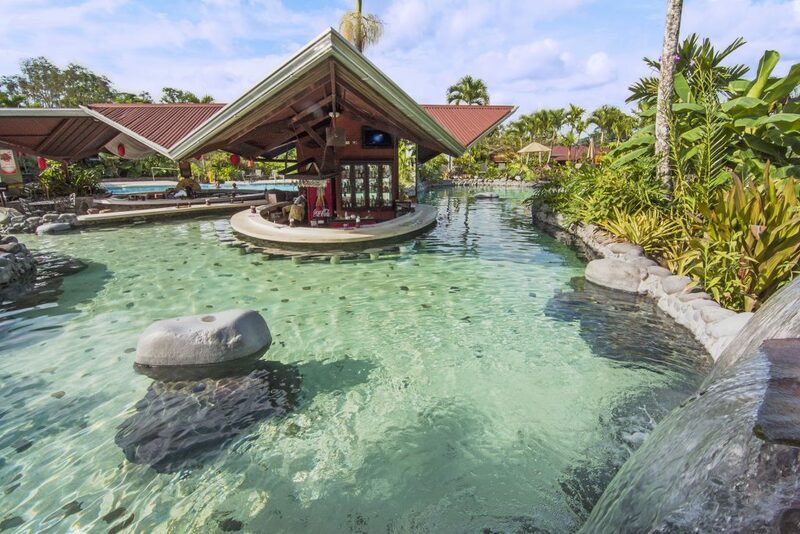 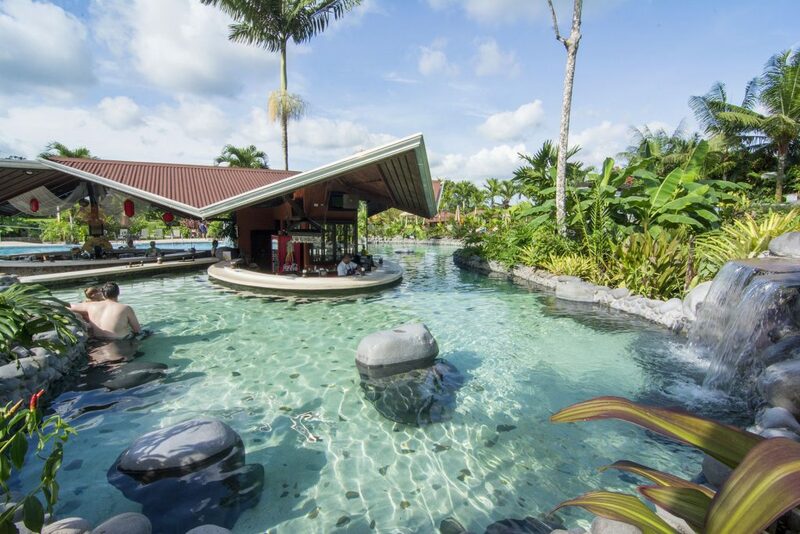 We have also created special features like carefully chosen river rocks to form the bar stools of the wet bar, waterfalls to offer you a relaxing hydro-massage, and a soothing jacuzzi. 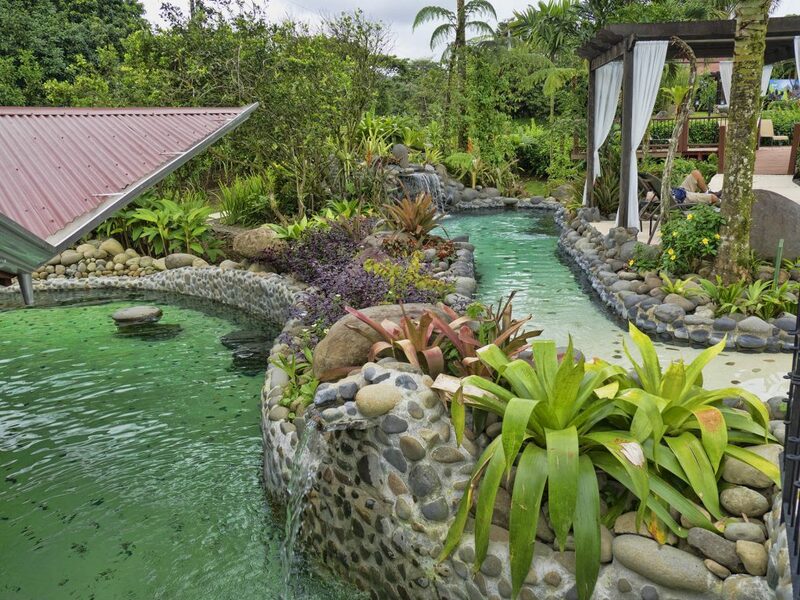 The pools range in temperature from 34-40°C (93-104° F) with a pH of 6.7. 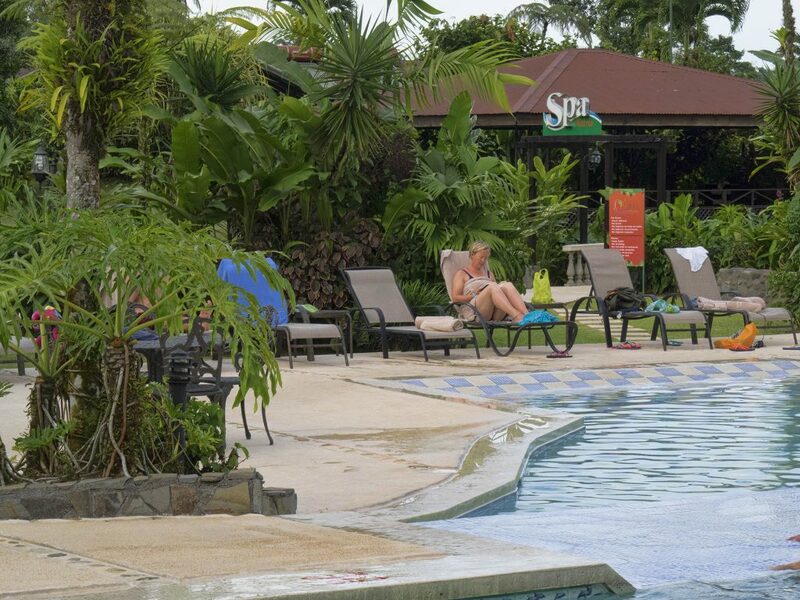 Relaxing gold tones surround the pool area where you will find plenty of chaise lounges, in addition to charming wrought iron tables and chairs and romantic private gazeebos. 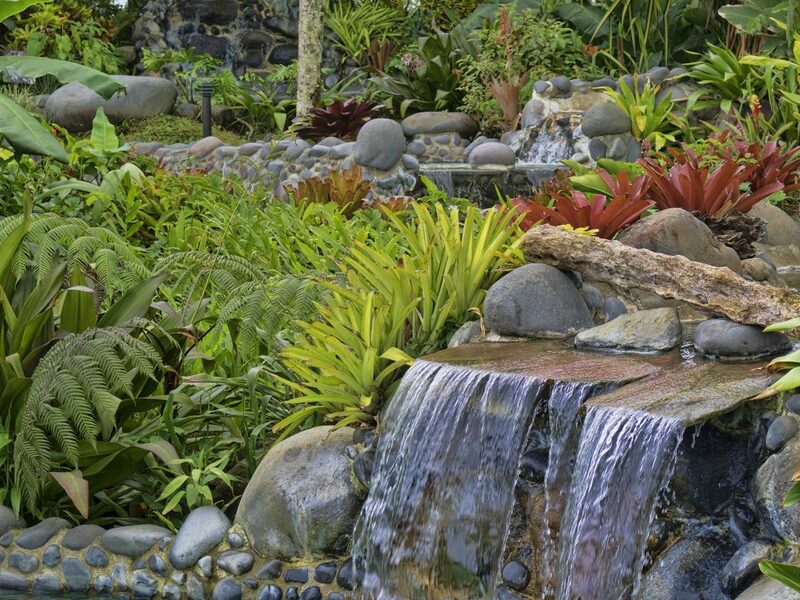 Just let down the sheer curtains on all sides to truly get lost in the moment, or in the eyes of your loved one. 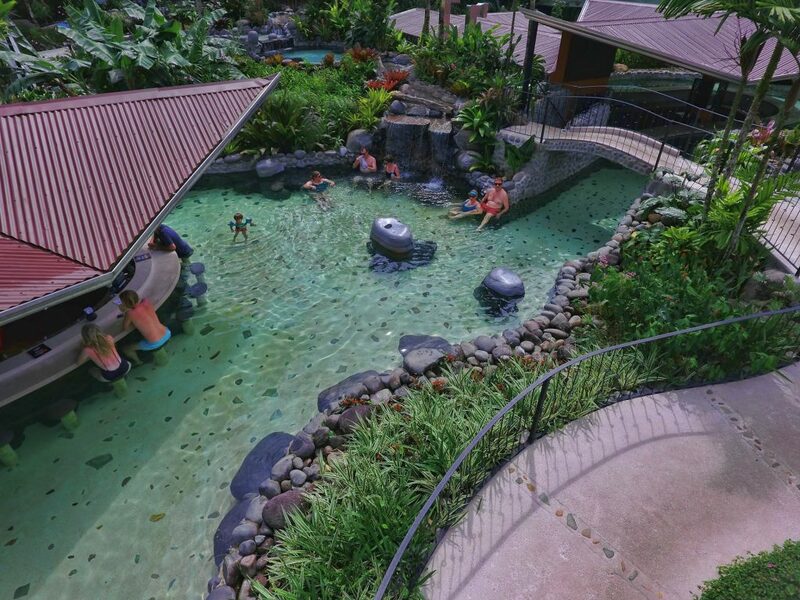 The simulated wood deck, made from recycled plastic, is the ideal place to sunbathe or read a good book. 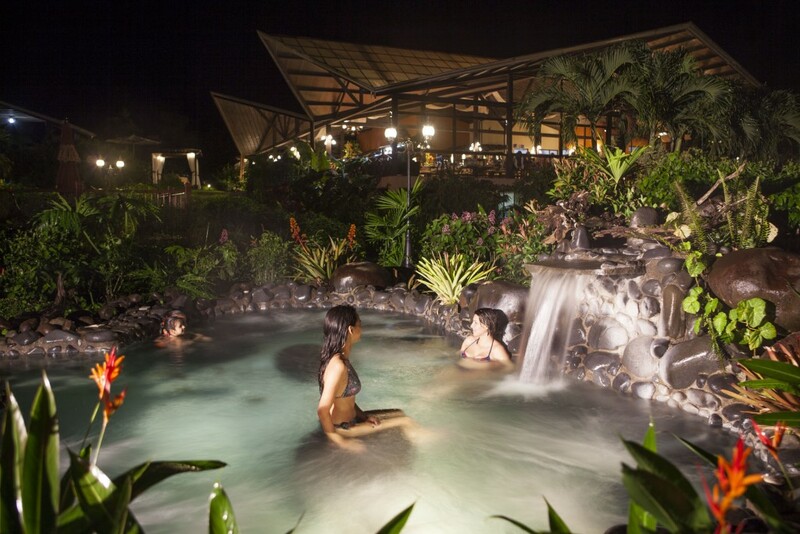 In order to assure the health and wellness of each of our guests, we drain the thermal pools each night at 10 pm, in order to scrub and dry them entirely. 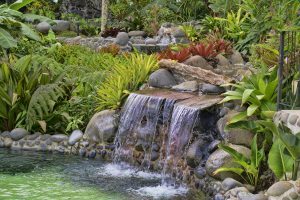 In this way we prohibit the growth of natural algae and moss. 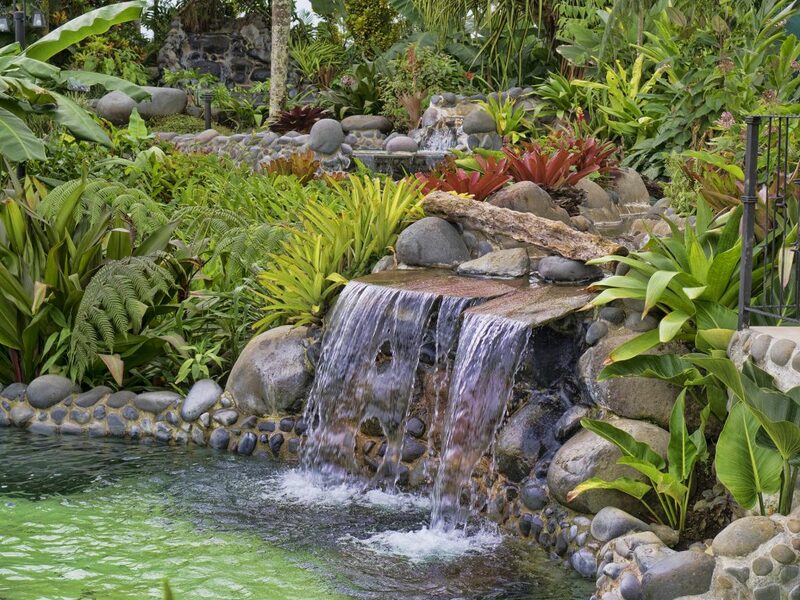 This also greatly reduces the possibility of slipping and falling. 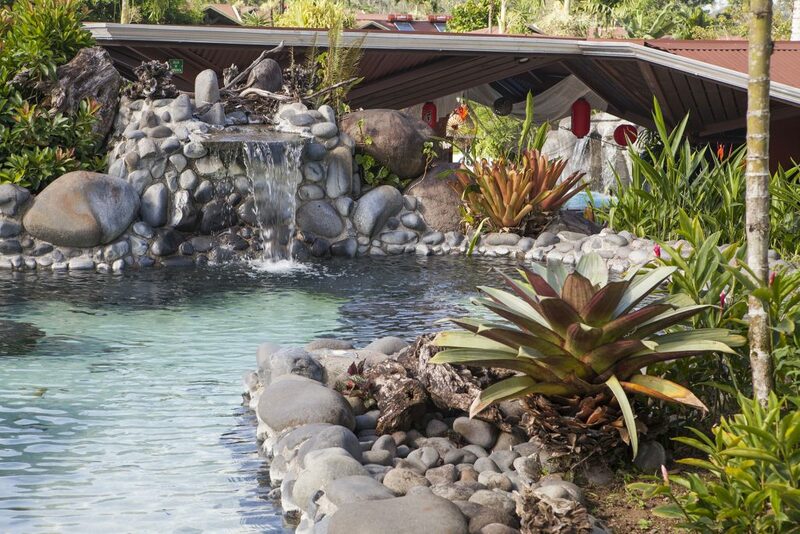 The pools then begin to refill naturally around 4 am and are ready for use by 8 am. 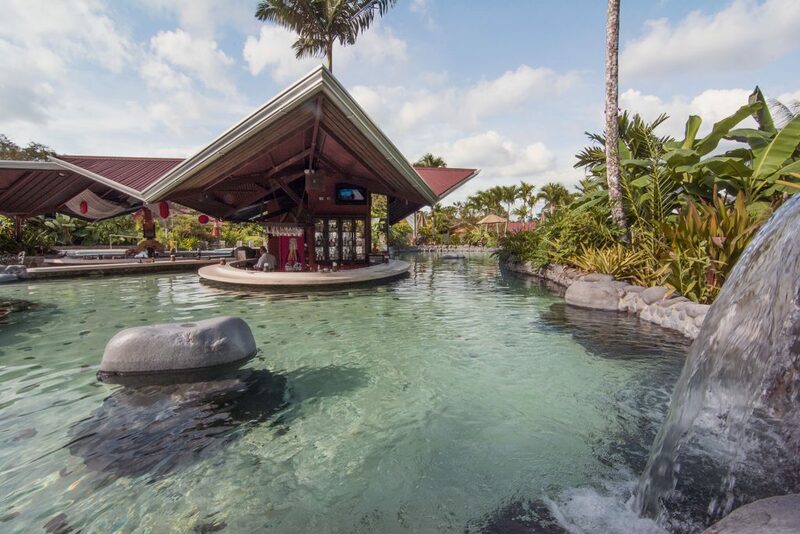 In addition to authentic Japanese sushi in our Sakana Sushi Bar, you can enjoy nachos, sandwiches, French fries, and other snacks together with your favorite national or international beer, cocktail, or fresh fruit smoothies in the wet bar, all while soaking in the soothing springs. 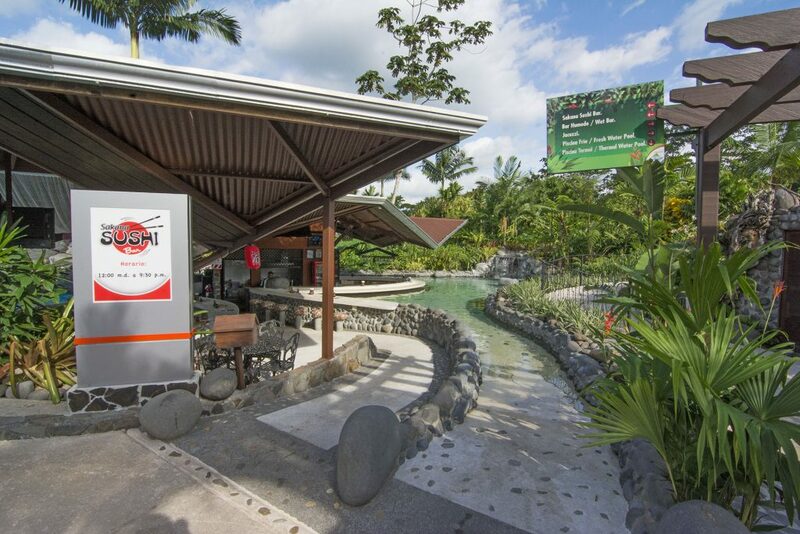 In this area, you can also enjoy the most important sporting and entertainment events on the large screen TV. 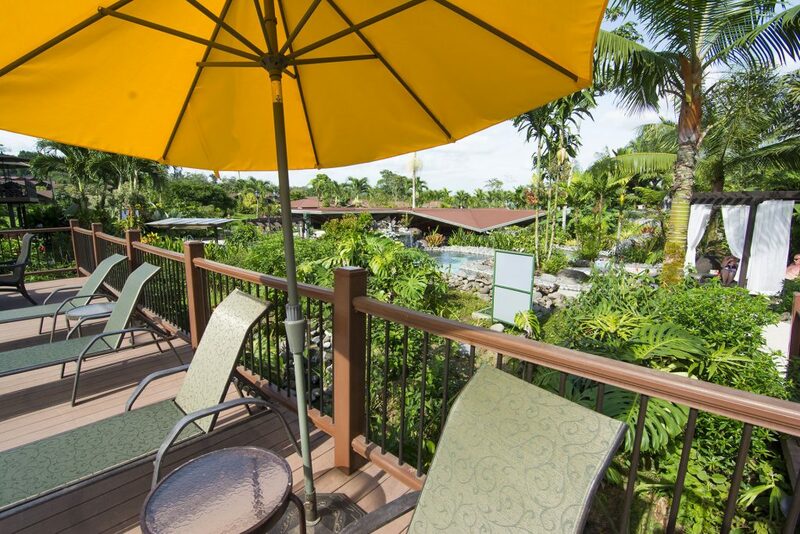 All poolside, and wheelchair accessible. 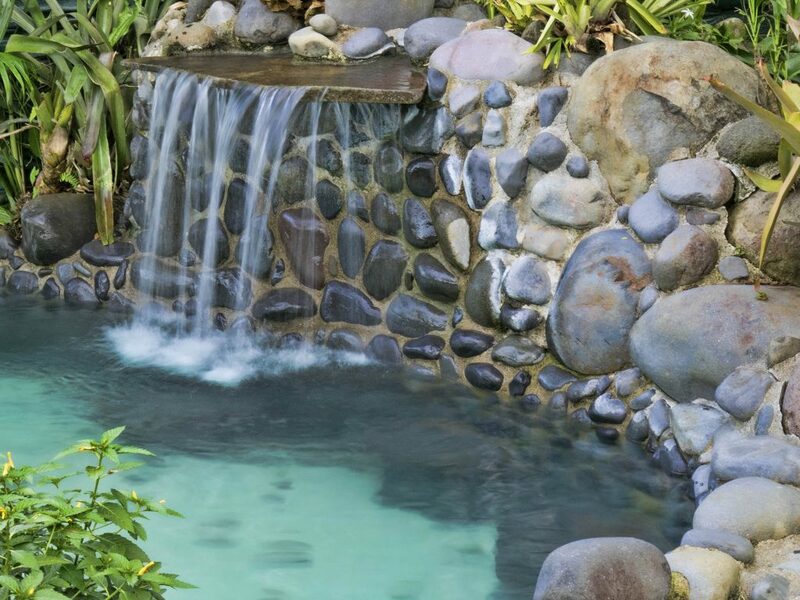 Our modern process of mineral salts eliminates the need for high quantities of chlorine. 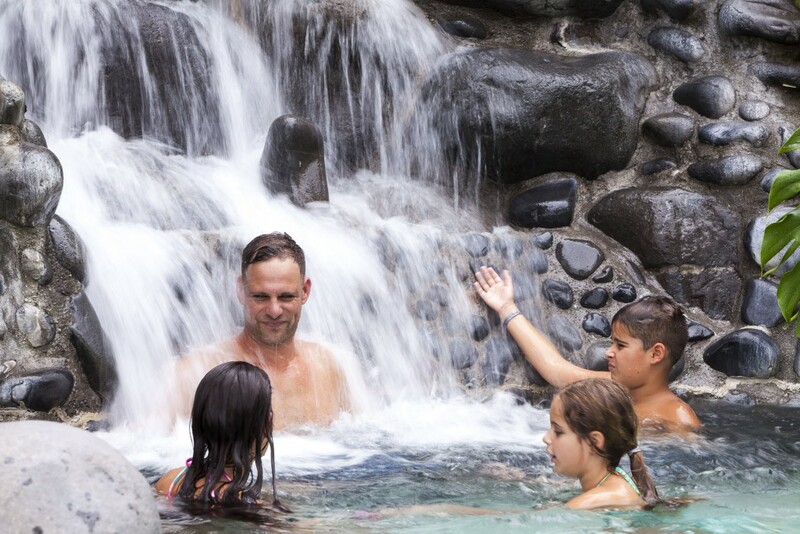 With this natural procedure only a small amount of chlorine is used as a catalyst to activate the mineral ions. 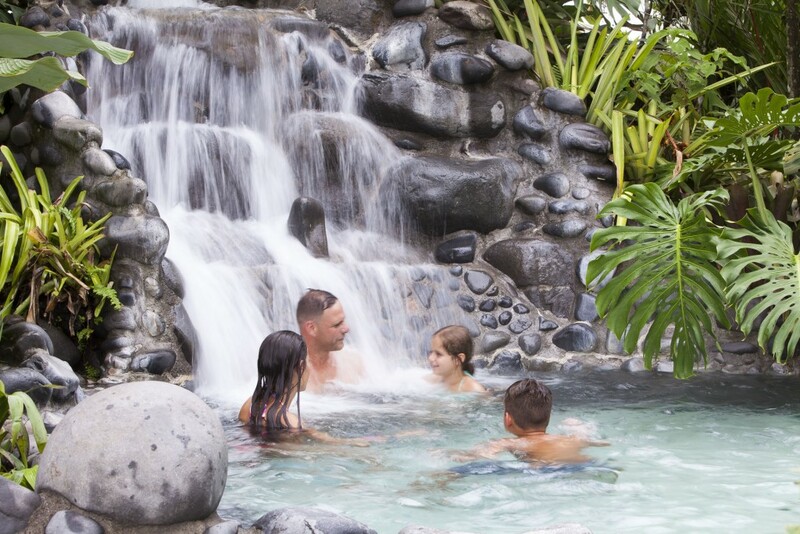 This allows you to swim comfortably in each of our 3 fresh water pools, without irritating your eyes, causing heartburn, allergies, or fungal infections which are normal side effects of chlorinated water. 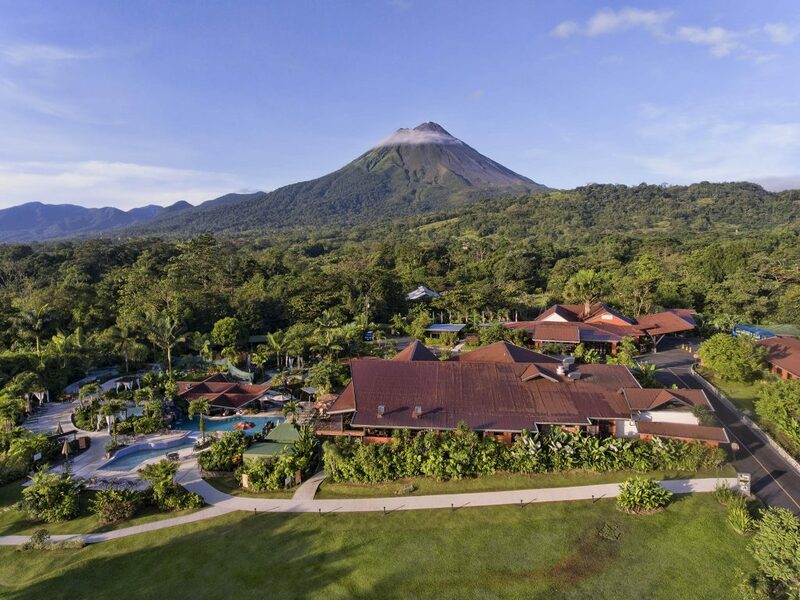 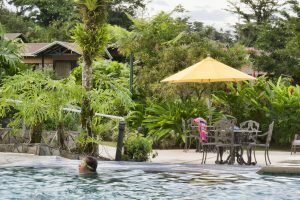 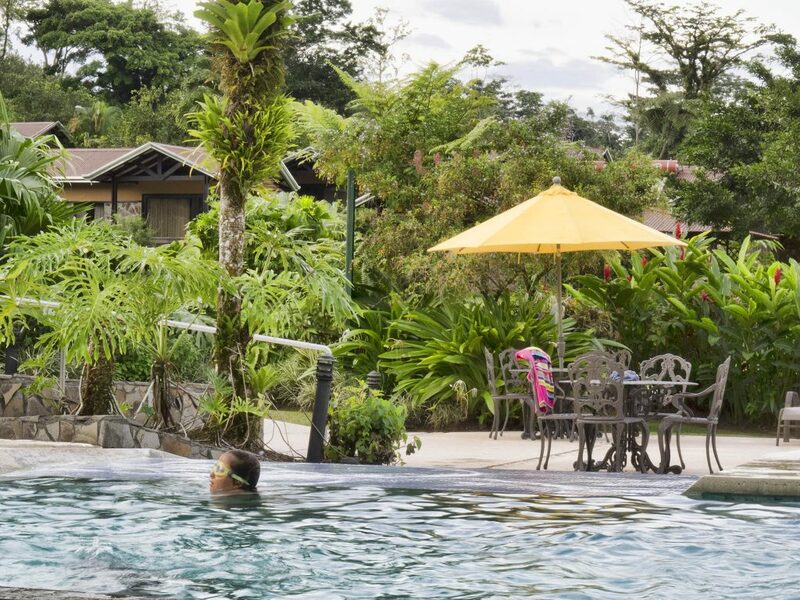 Children are valuable guests at Arenal Springs as well, so we have made sure they have areas apt just for them, and our refreshing swimming pools and hot springs are no exception.